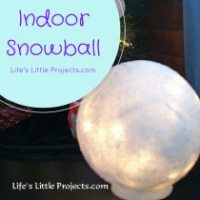 Our friend AmieJo from Life’s Little Projects asked if we’d be interested in making a Christmas decor item using something we found in a thrift shop. It sounded like a fun challenge, and after finding 3 matching frames, we decided to make a pretty JOY sign. I bought three gold 8×10 frames that would be the base of my framed burlap JOY sign. The first thing was to remove the paper backing, picture and glass. Then I added two coats of gesso to the frame, letting each coat dry throughly. Again I turned to my FolkArt Chalk Paint in the color Sheepskin. I used two coats of the chalk paint, again letting each coat dry before adding the next coat. I also took the flower picture and gessoed over the picture since I was going to cover it with burlap and I didn’t want any of the flowers to show through the burlap. Once the paint on the picture was dry I glued burlap to the picture using E6000. I took a wax brush and some Annie Sloan dark wax. I dabbed just a little onto the brush and off loaded some onto a paper towel. Then I lightly brushed over the painted frame to age the frame just a bit. Once I was happy with that, I used my E6000 again and glued the picture covered in burlap to the frame. 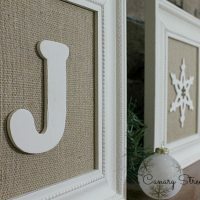 I purchased a J, Y and a snowflake and painted those with the FolkArt Chalk Paint in Sheepskin. When they were dry I glued one letter to the center of the burlap of each frame. This is the finished project and I’m really happy with how it turned out. Want to see what our friends did with their thrift store items? Check out their projects below! This turned out great. They look so pretty and store bought! Thanks AmieJo!! And thanks for letting us join in the fun! We LOVE thrift store projects! Your framed “joy” sentiment is so pretty. Thanks for the inspiration! SOOOOO pretty! Those frames look amazing painted up all snowy white and that snowflake is just perfect!!! Love these! The snowflake in place of the O is such a nice touch. Stopping by from Social Media Link Party. Those frames look so much better white. Love the burlap background too. They turned out great! I have some old frames lying around. I like this idea. Very artistic! I love that! This is so cute! And I love how you recycled the frames! Thanks for sharing and linking up at #SoMe2 this week! Love it. What a great reminder this season for Jesus, Others, and then You. I love these! I’ll be searching for frames next visit to the 2nd hand shop! Visiting and following via the #SoMe2 party! So cute!! I love that you used some thrift shop frames for this project! Turned out adorable! LOVE these!! Such an easy way to make thrift store frames look amazing!! Love the little snowflake in the middle. 🙂 Pinning these!! Wow! I had no idea this was out of thrift store frames at first! Gorgeous 🙂 Thanks so much for sharing it at On Display Thursday this week!